As part of this effort, three bedrock CGPS stations were installed along the western side of the Peninsula in April 2009 to measure post-glacial rebound to help reconstruct the detailed configuration of the northern Antarctic Peninsula Ice Sheet (APIS) during the Last Glacial Maximum (LGM) and subsequent retreat. Six more CGPS sites are planned for installation in early 2010 - three on bedrock on the east (Weddell Sea) side of the Peninsula, and three on outlet glaciers from the Bruce Plateau. The bedrock CGPS stations are also a part of the POLENET IPY project. 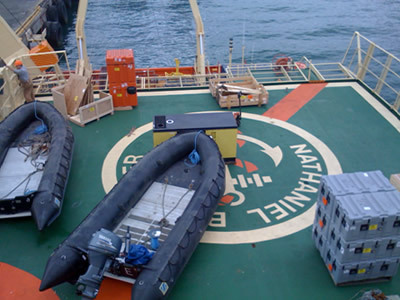 Support was provided at the port call in Punta Arenas, Chile to prepare the CGPS equipment and train the science teams that will be doing the installations from the Nathaniel B. Palmer research vessel. 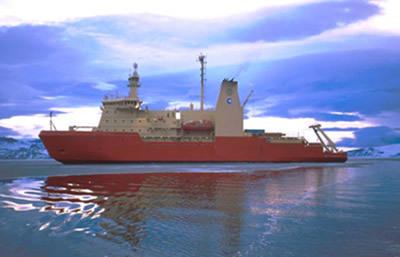 Figure 1 - RV Nathaniel B. Palmer will be supporting the LARISSA project for 2 months (photo: LARISSA project web page). Figure 2 - GPS and seismic systems loaded on the helo deck. 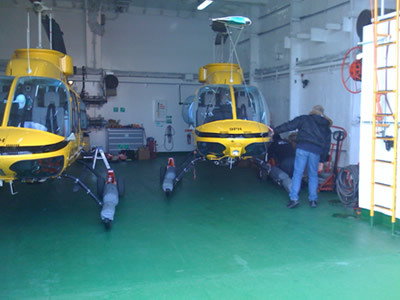 Figure 3 - Bell 206s in hanger onboard - this is just the second time that helicopters have operated from the NBP.